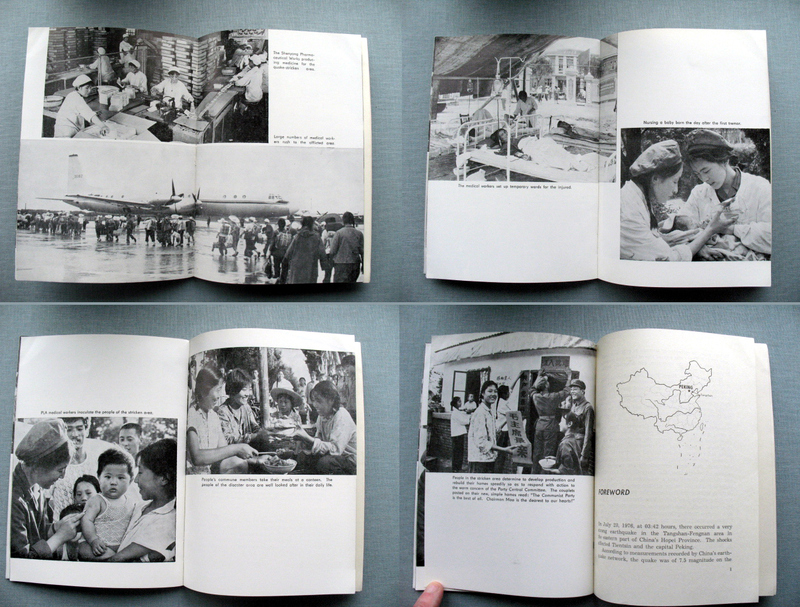 This small softcover book is a collection of photographs and reports dealing with the aftermath of the devastating earthquake which struck just outside Beijing. Coming as it did in 1976, when the various rivals looking to succeed a increasingly incapacitated Mao were jockeying for position, the book must be one of the last officially sanctioned expressions of ultra-Maoist thought. The text is replete with references to criticising Deng Xiaoping, locating it firmly on the side of the Gang of Four, including Mao’s spiteful wife, who were intent on continuing the hardline path. Deng was the one who repudiated the excesses of the Cultural Revolution while venerating Mao’s memory that led to China emerging from the isolation and paranoia of its murderous founding father. 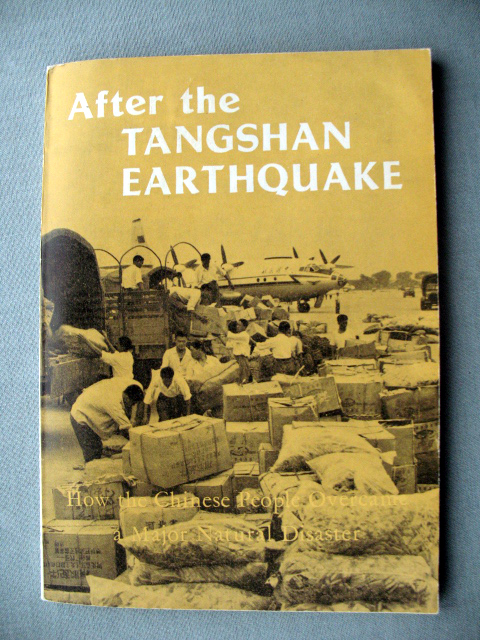 It was into this political maelstrom that the devastating earthquake centred on Tangshan occurred which claimed approximately 250,000 lives. Despite this book being ostensibly about the humanitarian rescue and recovery effort, the political context is ever present. A number of ‘heroes’ appear in the text who are presented as embodying the virtues of Maoist thought, which can be summed up by ditching your family who may be trapped in the rubble, holding a meeting with fellow communist cadres (at which time you adopt a resolution criticising Deng Xiaoping) and finding some quote from Mao that is supposed to guide your actions. 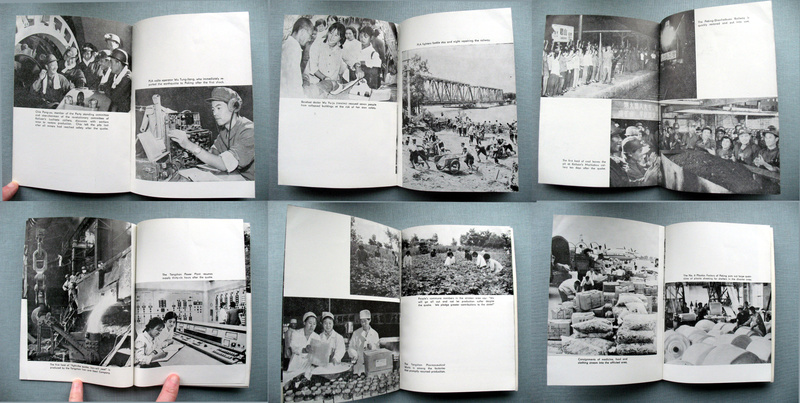 The images accompanying the book are culled from supposedly photojournalistic sources but most have been carefully constructed and posed to present an idealised image of recovery from disaster. We see no pictures of ruins, bodies or suffering. Instead we are presented with the clean, orderly world of the Maoist imagination where fresh-faced and loyal cadres selflessly devote their energies towards reconstruction. 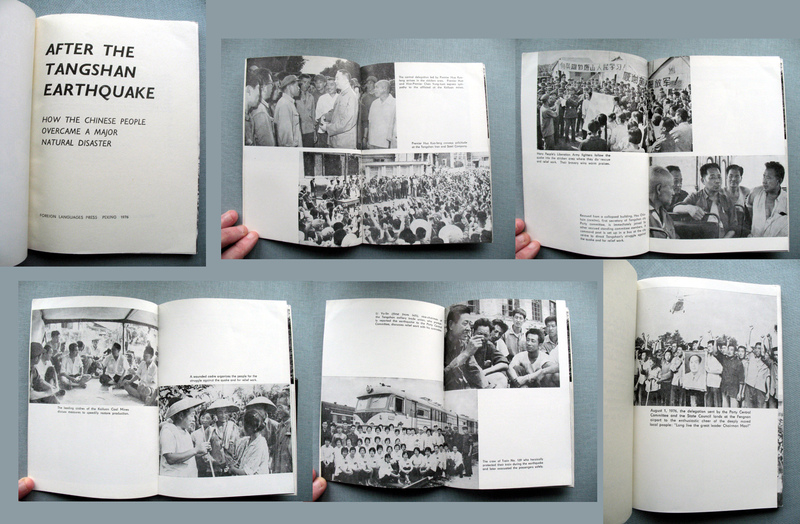 Mao only appears once in the photographs, his portrait is held aloft by a crowd chanting their gratitude towards him at the front of the book. Abundance is represented through the copious amounts of aid being loaded onto planes, industry is back at full capacity thanks to the smiling miners clapping the coal conveyor belt while smiling victims receive medical treatment and food from the ever efficient PLA. The whole narrative is absolutely ridiculous and it shows just how fervent the propaganda machine was after a decade of Cultural Revolution chaos and violence. As usual in such extreme situations where everybody is suspect and the threat of violence is ever present, official propaganda becomes more and more fantastic in its claims as both the producers and readers of this material vie to prove their loyalty for protection. But viewed from outside the context of fear that produced it, the fantasy collapses.